Yesterday, a delegation of women environmental defenders from the Americas testified before the Inter-American Commission on Human Rights, condemning widespread unjust criminalization and repression against those who assert their rights to land and environmental protection. The women highlighted abuses against defenders – including themselves – in the context of extractive industry projects, in order to shed light on this grave human rights situation and encourage governments in the Americas to stop perpetrating and permitting these violations, especially against those who are women, indigenous, Afro-descendent or campesino. They argue that it's urgent for governments in the Americas to adopt effective measures to protect defenders and prevent these types of human rights violations. 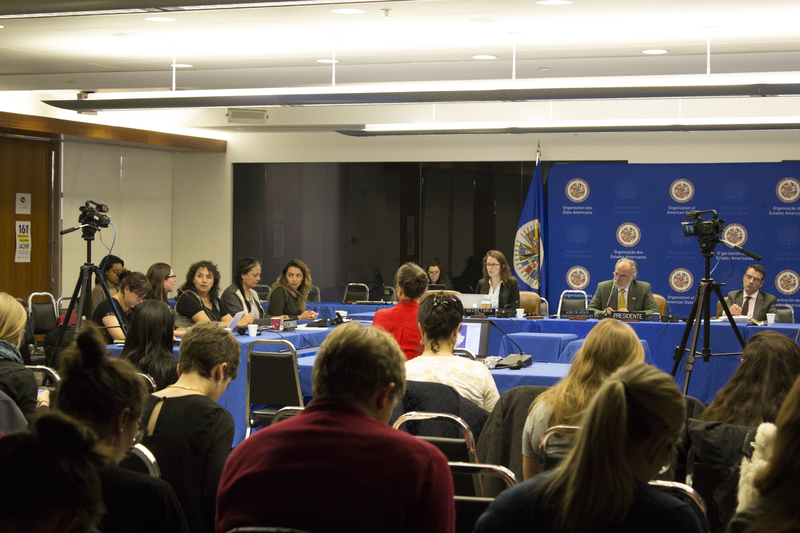 Yesterday’s hearing followed an October 2015 thematic hearing on the situation of women environmental defenders in Ecuador, presented by EarthRights International (ERI) and the Ecuadorian NGO Acción Ecologica. Also testifying were two women from Acción Ecológica, Esperanza Martinez Yanez and Ivonne Ramos, whose experiences highlight the sexism that disproportionately affects women defenders in the Americas. In December 2016, the Ecuadorian government tried to shut down Acción Ecológica as retaliation for the support of the Shuar indigenous people whose territory was militarized for the interests of a Chinese mining company. The hearing comes at a critical time for environmental defenders, as numerous governments in the Americas have disproportionately favored the interests of corporations and their impunity when they commit human rights violations. Its accompanying report will highlight extreme examples of human rights abuses in Ecuador, Peru, Honduras, Guatemala, Colombia, Brazil and the United States. "In the Americas, the majority of attacks against environmental defenders result in impunity that favors the perpetrators. Moreover, in certain countries, such as Peru, Colombia and Honduras, there are norms that permit private security agreements between extractive companies and public forces. The agreements between mining and oil companies and the Peruvian national police are lethal for defenders," added Bravo Valencia. "We have documented much violence against defenders that occur under the framework of these agreements in the Cajamarca region of Peru where there are numerous social and environmental conflicts and the unjust criminalization against leaders who denounce the negative impacts of mining projects." The thematic hearing was well received by the Commission. Commissioner José de Jesús Orozco Henriquez, who is also the Commission’s Rapporteur for Human Rights Defenders, was alarmed by the increase of attacks, violence and deaths against and of land and territory defenders. He also noted the importance of maintaining a gendered perspective when examining these issues because attacks and violence against women defenders have increased. The hearing was presented in partnership with EarthRights International, Acción Ecologica, and FIDH, as well as the Latin American Network of Women Defenders of Social and Environmental Rights (Bolivia), Oilwatch Latin America, Urgent Action Fund for Latin America and the Caribbean, Saramanta Warmikuna Network of Women (Ecuador), Arturo Escobar, Joan Martínez Alier and Naomi Klein.